As members of the Church of Jesus Christ of Latter-day Saints, we are taught how to receive personal revelation from childhood. Adult converts are taught by the missionaries how to seek it before they are baptized. From the pulpit in Church and in General Conference we are exhorted to seek the counsel of the Lord and to try to discern His will through prayer and meditation. We know that by doing the other basics: scripture study, attending Church meetings, keeping the Word of Wisdom, holding Family Home Evening, writing in our journals, we prepare ourselves to receive personal revelation. None of these things require working the 12 Steps. Step 11: Seek through prayer and meditation to know the Lord’s will and to have the power to carry it out. Why is Personal Revelation Part of Recovery? Why is personal revelation included in the Addiction Recovery program if we already learn about it as a part of the gospel? What is different about the practice of receiving personal revelation as part of working the Steps? How do steps 1-10 prepare us to receive personal revelation in a deeper way? Step 1: Admit that you, of yourself, are powerless to overcome your addictions and that your life has become unmanageable. Step 2: Come to believe that the power of God can restore you to complete spiritual health. Step 3: Decide to turn your will and your life over to the care of God the Eternal Father and His Son, Jesus Christ. Steps 1 through 3 (see “I Can’t, He Can, I’ll Let Him”) are a “simple” to follow breakdown of the anatomy of faith. When I (1) admit that I cannot do what needs to be done by my own power and strength, (2) acknowledge that God has all power and can, in fact, make it happen, and (3) make a decision to allow God to team up with me and help me on my journey through life, I am practicing faith in Him. These are not simple statements that I just have to read and accept. No, not at all. Working these steps takes me through serious introspection and effort. This work, and it is hard spiritual work, takes me from a place of surface acknowledgment of the principle of faith, to deep down, in my heart, “wrestling with God” to receive the gift of faith. Step 4: Make a searching and fearless written moral inventory of yourself. Step 5: Admit to yourself, to your Heavenly Father in the name of Jesus Christ, to proper priesthood authority, and to another person the exact nature of your wrongs. Step 6: Become entirely ready to have God remove all your character weaknesses. Step 7: Humbly ask Heavenly Father to remove your shortcomings. Step 9: Wherever possible, make direct restitution to all persons you have harmed. Step 10: Continue to take personal inventory, and when you are wrong promptly admit it. 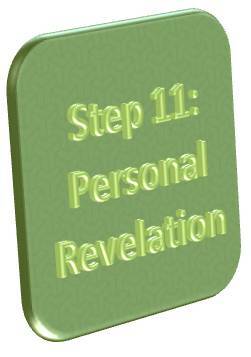 Earlier in this post I asked a few questions about why personal revelation is included in the 12 Steps. Here are my answers. By working Steps 1-10, we develop a deeper level of faith and a state of humility. Through sincere repentance and the grace of the Lord, we receive a new and humble heart. The old, proud and stony heart has been rooted out of our breasts. With this broken heart and contrite spirit, we are prepared to receive personal revelation almost as if we were conversing with God, face-to-face. Receiving personal revelation is part of God’s plan for us. He wants us to receive it. There are those who somehow intuitively know how to turn to Him in this way without working the Steps. I am not one of them. It was working Steps 1-10 that truly prepared me to receive communication from God. I am grateful for the 12 Steps in my life. I am grateful for my addiction and the things that brought me to the ARP program. The price I had to pay to get here was well worth the reward: an intimate relationship with my Savior that is characterized by regular and meaningful personal revelation. Are you satisfied with the quantity and quality of personal revelation in your life? What do you think it would take for you to improve in this area? What are you willing to do today to make progress?